This topic contains 29 replies, has 3 voices, and was last updated by Nayem 4 years, 3 months ago. These tabs do not function. 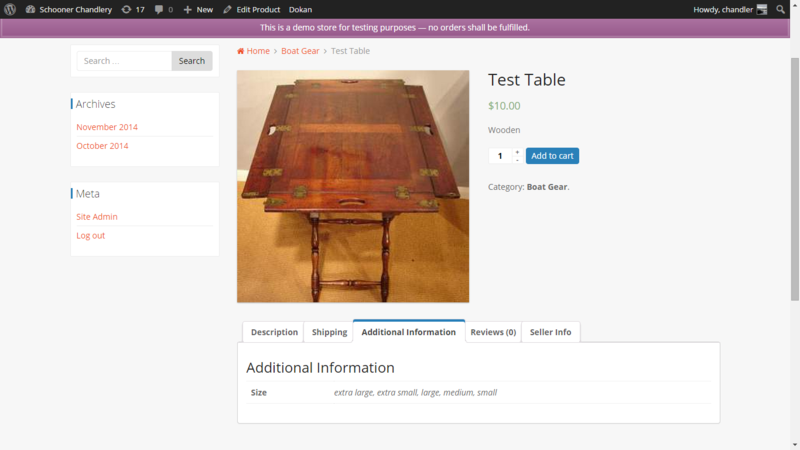 The seller is not taken to the place on the page that each tab is pointing to. It is, of course, possible to update all the items (options, inventory, shipping, attributes) by scrolling down to that area. But—how to get the tabs working? Other issue – I've added a product atribute called “color” in WooCommerce but it is not showing up as a potential attribute for my sellers to select. I have had the sellers add a custom attribute to a product called “customattributecolor” and put the choices of red and green. These show up to customers in text on the product page but there seems to be no way for the customer to select the customattributecolor and the WC attribute of “color” is just lost somewhere. If you can assist, I'd really appreciate it! 1. Is there any error found?. Please check for error. You have to run your browser in console mode to check error. 2. You can read this doc for the solution -http://docs.wedevs.com/add-drop-down-attributes/. This doc will help you to solve your issue. If not, then please let me know. I had same issue now. my tabs are totally missing. any ideas? thanx! Please prove a screenshot to make me more clear. I am here to help you. figured out. had to add product first then tabs shows up right after. it would nicer you have all the tabs shown at first place. thanks! I am very glad to know that you have figured out it. Also thank you for your idea. I will notify about this to our developer team. The tabs do show on my dashboard (e.g. product page with all the tabs) but they still do not function. The information is displayed on the page but selecting the tab simply doesn't take you down the page to the correct place on the page. Hi, our in-house developer is investigating the tab issue as it seems to be theme related. However, the issue of customers not being able to choose an attribute is still with us and I don't think that is theme related. Any ideas? Thanks! 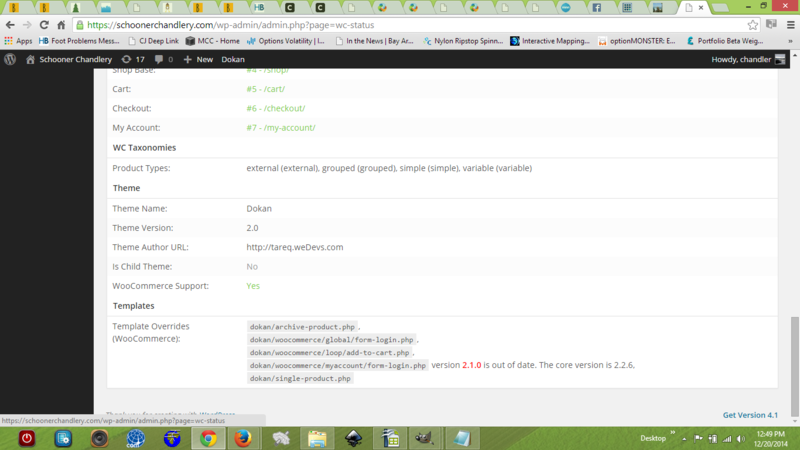 This product editing problem exists using our theme as well as all the common WordPress themes (e.g. 2012). We switched over to the Dokan theme itself–that makes it possible for our test seller to modify attributes and shipping so now we confirmed that our problem there was theme related. We note that the Dokan Child Theme E-Shopper also has problems with the Product Template (argh! that's your own theme and it doesn't work properly…) but we will work on our theme to get this part worked out. 1. dokan/woocommerce/myaccount/form-login.php version 2.1.0 is out of date. The core version is 2.2.6. So what to do about item 1 above? You are not updating Dokan theme are you? I do not see an update on your site for my download. Please advise. We will ultimately not be using the Dokan theme, but still wish to keep it up-to-date for testing purposes. 2. Even though our test seller can edit attributes and those attributes show up for the customer to see, the customer cannot select an attribute. This is likely something we're doing wrong here–but what can it be? 3. Also, we own the Dokan Child theme E-shopper theme, when we put it in place, we note that the performance of the seller's ability to edit an individual product is DIFFERENT than Dokan or our theme either one. The Dokan Child theme allows us to see/edit the product but only if we go ahead and hand enter https://oursite/product/product name/edit/ because the Dokan child theme E-shopper doesn't properly display any products when we click on product in the dashboard ( https://oursite/dashboard/products/ ) that area next to the dashboard menu is simply blank with no products. So that theme seems messed up. Perhaps related to the templates or something? Please advise for fixes. We are not using the child theme E-Shopper for this site but do plan to use it for a different site so need to know why it may have problems too. 1. The file you mentioned above have a comment to mention the compatible version of WooCommerce. the comment is something like@version 2.1.0. You can open those files and write 2.2.10 instead of 2.1.0. 2. I am not clear about this point. I think you are looking for the attributes. You can read this doc – http://docs.wedevs.com/add-drop-down-attributes/ to know more about attributes. 3. Now E-shopper is not a child theme anymore. It is an independent theme. So please make sure how are you using it. Are you using this theme as child theme or you are using the latest e-shopper which is main theme?. on 2. I've read the resource you provide and can add all kinds of attributes (drop down) but for some reason, my customer cannot select them. Do you have a live demo of Dokan somewhere online here where I can see what should be happening (for the customer) in action? That could be helpful. on 3. Was purchased as a theme and doesn't id itself as child theme but your own discussions always refer to it as such, thus, I call it “child theme.” It is the latest version being used, yes. So we are a bit confused about the problem with the product page edit (Like I said, we can edit if we just insert the address knowing what it should be, but that's all wrong. 1. Here is our demo site for Dokan- http://demo.wedevs.com/dokan/. You can test here whatever you want. 2. Yes, you are right we called e-shopper as child theme. Now forget them all. E-shopper now a main theme. You can use this theme as your main theme. If you are facing any problem to use this theme as main theme then you can tell me and i am here to help you. The demo site you pointed me to doesn't allow a customer to choose an attribute (like size or color) so I can't test out my problem. While I was easily able to create attributes (like I can on my own site) as a seller, it doesn't do any good if the customer cannot CHOOSE the attributes. I modified one of the demo sweatshirts as “B's New Sweatshirt in many sizes” and added small, med, large sizes. Easy. However, HOW CAN THE CUSTOMER SELECT THESE ATTRIBUTES?? Please provide explicit and detailed instructions regarding how this can be done — on your demo site at a minimum. Hi there, I just posted PART of this problem to my theme developer. I really think the problem is Dokan related so I don't expect the theme developer to come back with anything useful. Even so, here are the error logs that I shared with him and I'd really appreciate it if wedevs could solve this problem with the product edit tabs not working. Thanks. other pressing issue I am really looking for is product tax for vendors who can apply it to items individually. any updated ETA on this? The topic ‘Product Tabs not working and new Attributes not showing’ is closed to new replies.